"do sort of represent the "paramount style"." Well, i wasnt too fond of scratchers gfx. Though in retrospect they do sort of represent the "paramount style". "I never really liked the logo." Are you kidding me, this has got to be one of the best (next to the one on Xenomorph) intros from Paramount ever! 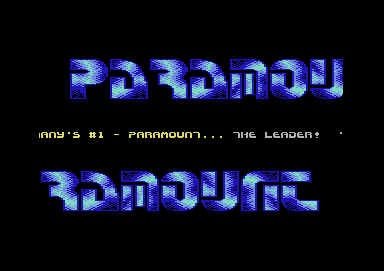 If there is one thing I will always remember Paramount for, it's those two ultraslick intros! Simple, clean and smooth intro. he did, I can confirm that. Scratcher (Hartmut) did it in Paint Magic if I remember correctly. I never really liked the logo. A simple intro that served its purpose. I think it was either Scratcher or Dr.Death or someone from around the gelsenkirchen area who did it. Fanatic was actually sting cracking under a different handle.